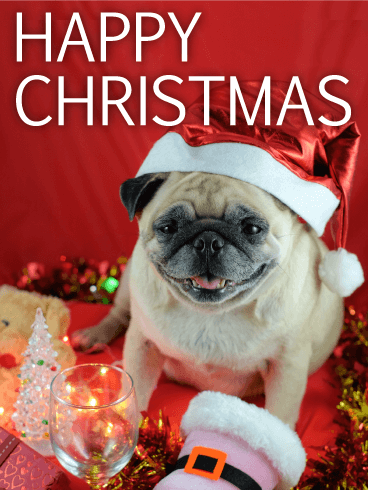 Say Happy Christmas with this card's adorable pug mug. The Santa pug on this Christmas card wears a jolly Santa hat as he celebrates the holidays with a joyous Christmas party! Red and green decorations, presents, glasses, small Christmas trees, and stockings make the perfect setting for a memorable celebration! 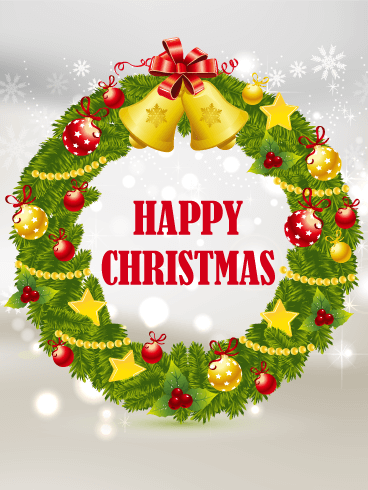 Send this Christmas card to wish your friends and family a "Happy Christmas" today! Here comes Santa Paws, right down Santa Paws Lane! 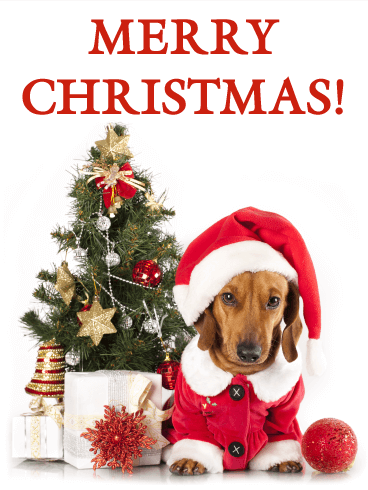 Say "Merry Christmas" like never before with this Santa Dachshund Christmas card! The adorable dachshund puppy is dressed in a Santa hat and suit, ready to deliver treats for Christmas. Presents rest under the Christmas tree behind him, which is decorated with ornaments, bells, stars and strings of silver beads. 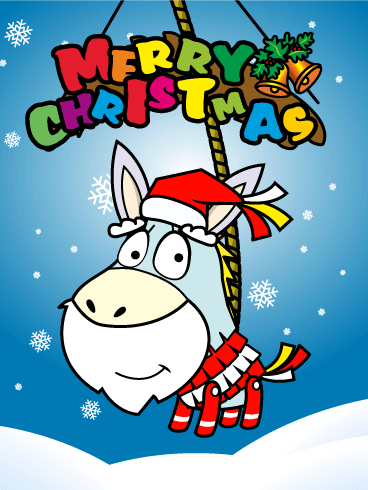 Send this Christmas card to your friends and family today! Send your friends and family an adorable puppy Christmas card! 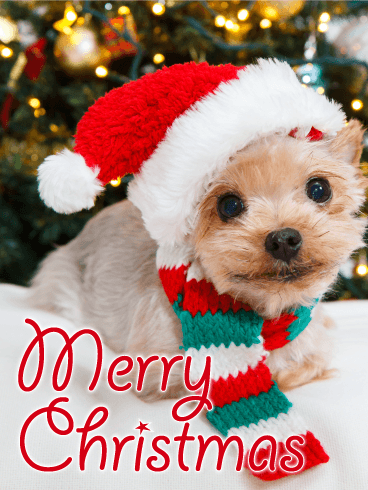 This Santa Yorkshire Terrier Christmas Card is the perfect way to celebrate the holiday season. This sweet puppy is sporting a fuzzy Santa hat and a cute red, green, and white knit scarf. The Christmas tree behind him is decorated with lights and ornaments and the ground is covered with a fresh Christmas snow. 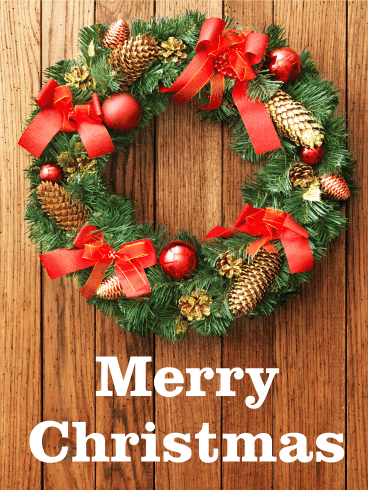 Use this sweet card to say "Merry Christmas" today! 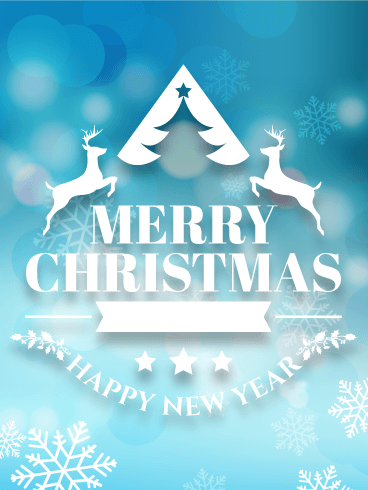 We wish you a Merry Christmas, we wish you a Merry Christmas, we wish you a Merry Christmas, and a Happy New Year! 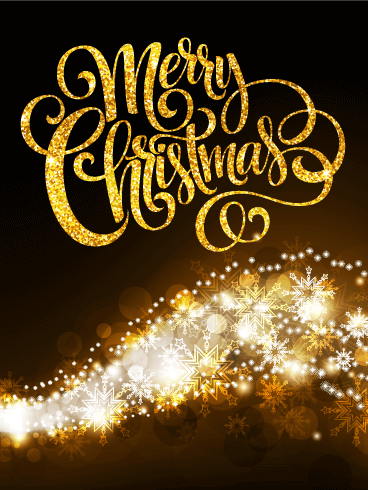 Send good tidings to your friends and family with this beautiful typographic style Christmas card. 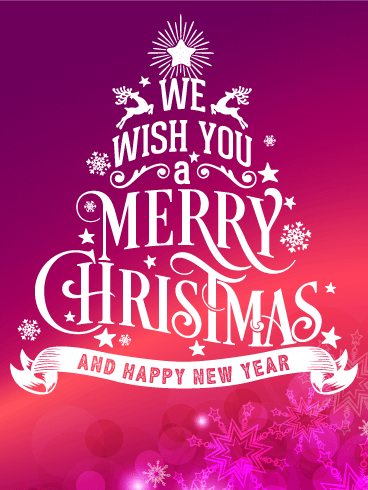 The background is a blend of purples, reds, and pinks with bright pink snowflakes and stars. 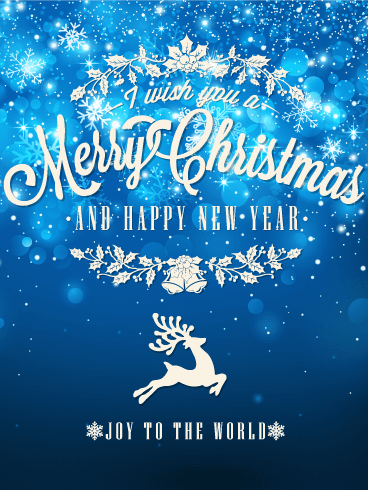 The holiday message is written in elegant type and joined by reindeer, snowflakes, and shining stars. 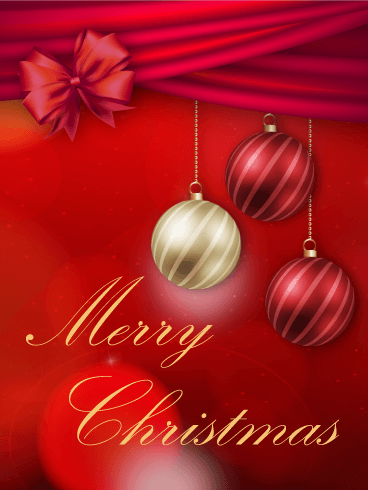 Send this Christmas card today! 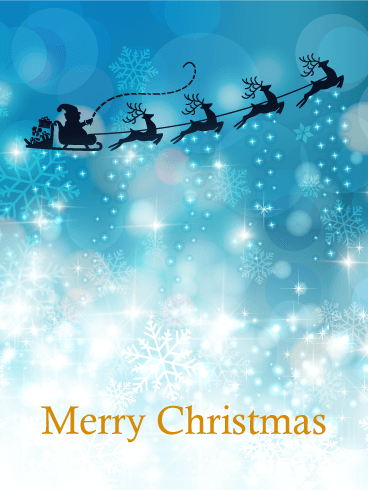 Do you know someone hip and cool who would love to receive a Christmas card? Send them this retro Christmas card today! The groovy background looks like a picture from space, with swirled colors of green, purple, blue, and pink, joined by bright stars and snowflakes. 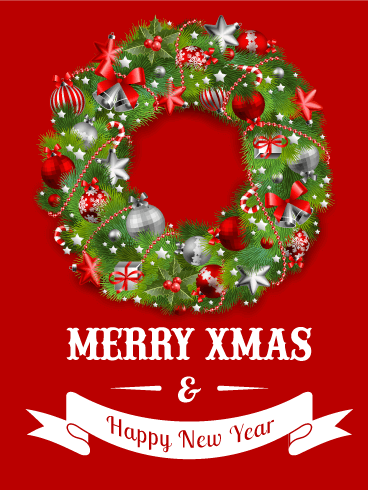 The "Merry Christmas" message in the center is surrounded by artful swirls and a white prancing reindeer. Say it simple. Say it beautiful. This Christmas card does both. 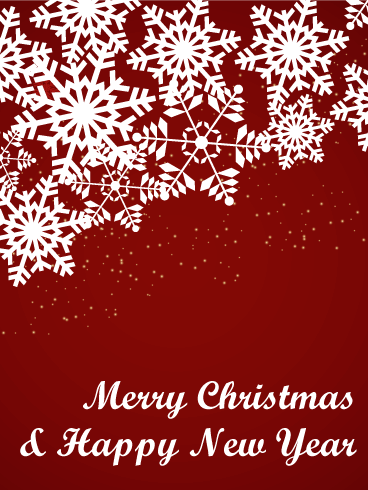 For warm wishes this holiday season, this elegant Christmas and New Year's card is for you. It is chic and artistic with just the right about of dazzle. We created it with love just for you and your loved ones to enjoy this holiday season. 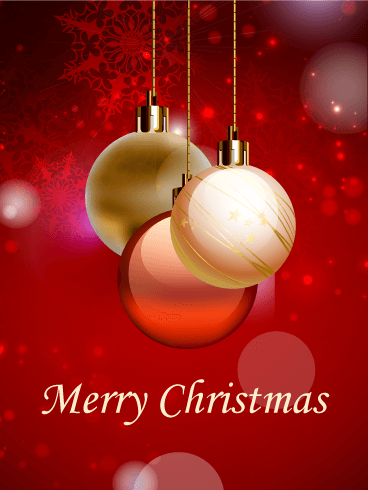 Light up their life and send a great Christmas greeting now. Joy to the world begins with you! 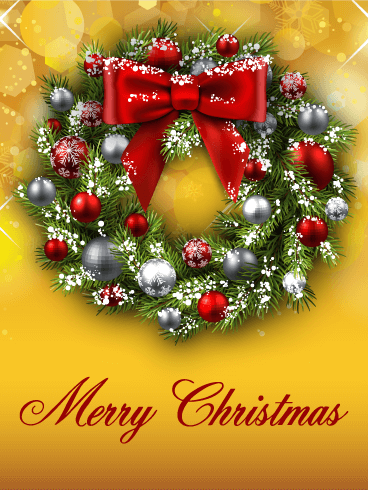 Spread some love this Christmas season with a truly stunning Christmas and New Year's greeting. There are so many ways to spread joy, and sending a holiday greeting is one of them. Let's flood inboxes with snowflakes and reindeer, Christmas bells and starry nights! Winter is here. Christmas is coming. And, the spirit of the season is love. Throw it back with this delightfully retro Christmas card. 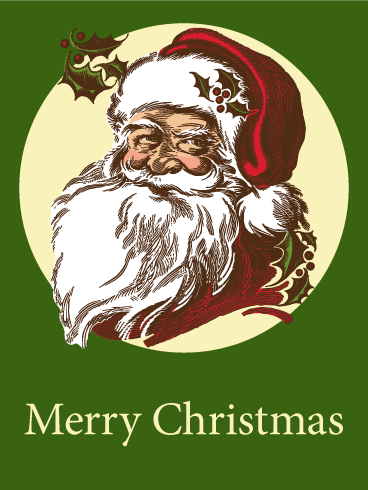 Vintage Santa never looked so good, and we absolutely love the warm, muted tones of red and green. It's a very hip and very beautiful Christmas card all rolled into one. You'll want to send this greeting card to everyone on your list because it's just so great. This vintage Christmas greeting card warms the heart and brightens the face. Send this jolly old St. Nicholas now. Perhaps one of the loveliest lines in a Christmas song is this, "I heard the bells on Christmas day, their old familiar carols play. And wild and sweet, the words repeat of peace on earth, goodwill to men." 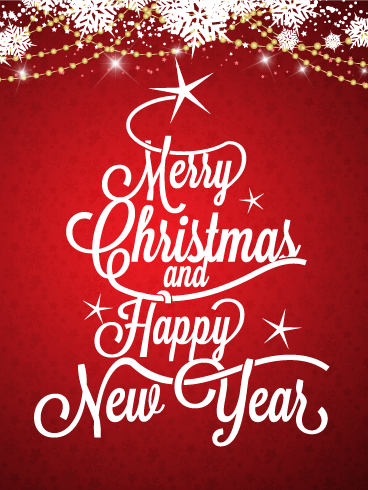 Wishing you and yours a year of peace and goodwill at this Christmas time and New Year. 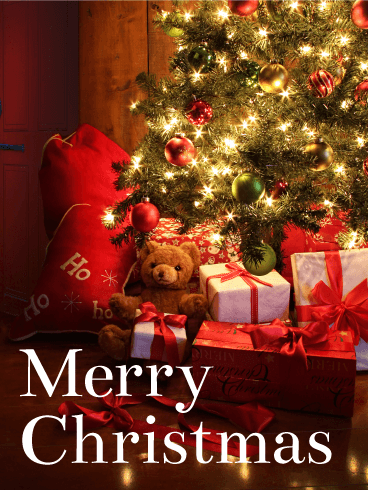 With a perfectly placed sprig of mistletoe, and the stars shining brightly behind the gold bells, this Christmas card is elegant, sentimental, and just perfect. Nothing is more breathtaking at Christmas time than a fir tree decked in shiny bulbs and twinkling lights. These beautiful branches offer warm wishes for a very Merry Christmas. Intricate snowflakes dance around in holiday joy on a rich red backdrop for a stunning visual treat that. This holiday greeting card captures the essence of Christmas - the warmth and light, that are abundant and abiding during this happy season. Oh, holy night, the stars are brightly shining! There's magic in the air and glory everywhere. This Christmas card captures the hushed silence of a winter's night, and the dazzling beauty of twinkling lights and starry skies. 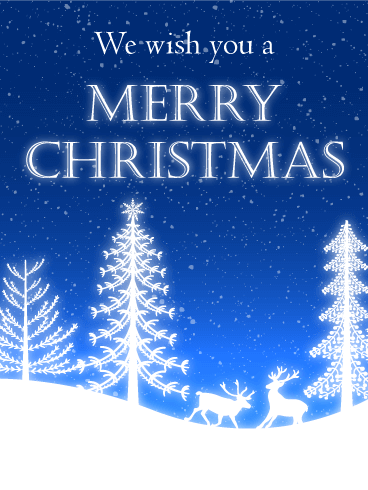 Wish someone a Merry Christmas with this midnight blue greeting card that is full of light and full of love. The reindeer are even in awe of it! Let it snow, let it snow, let it snow! 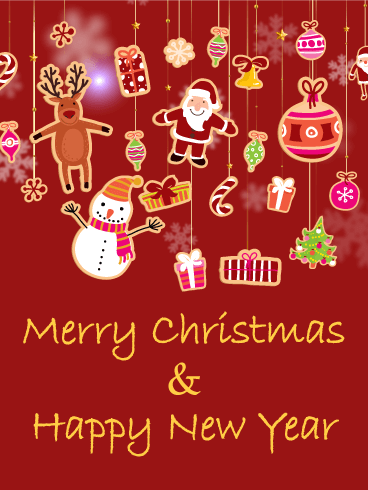 Send this merry and bright Christmas and New Year's greeting card. Tis the season to catch freshly fallen snowflakes on your tongue and to feel the crisp wintry air sneak up your coat sleeves before heading in for a hot chocolate. This icy blue Christmas card looks like frosted glass, and is a delightful treat for the eyes with pure white stencil cut-out reindeer, stars and of course, a Christmas tree. O Christmas tree, O Christmas tree, how lovely are your branches! 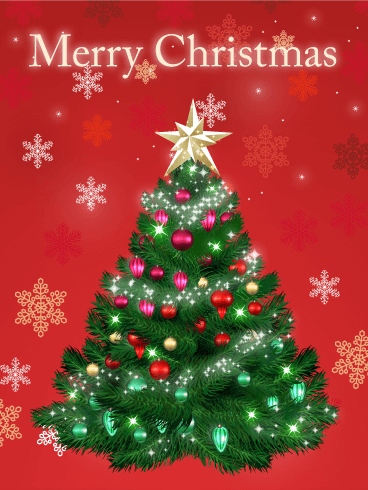 Wish a Happy Christmas to friends and family with this glowing Christmas tree card. 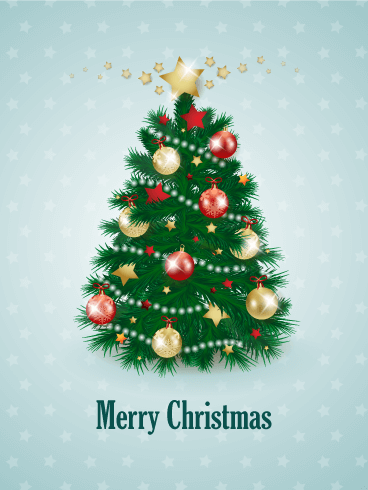 Bright, twinkling lights form a magnificent Christmas tree, topped with a shining Christmas star. 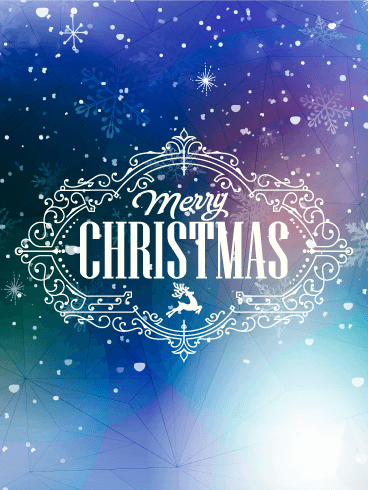 The dark blue colors and glowing tree that fill this Christmas card will make your holiday greeting shine from the screen with Happy Christmas cheer. 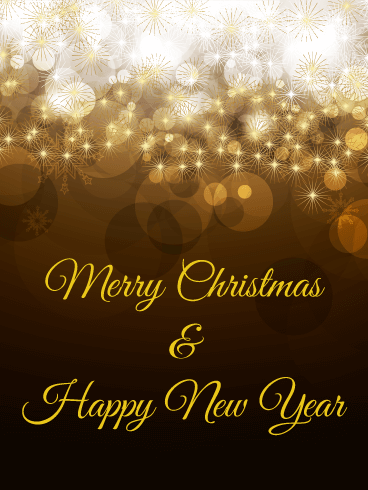 Bright lights and shining stars are the best way to say "Merry Christmas & Happy New Year!" 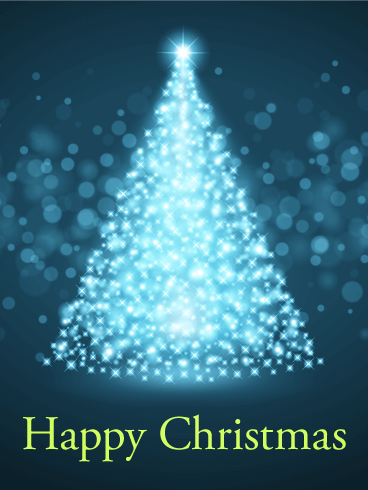 This cheery Christmas card uses snowflakes and bright starry lights to create a shining blue Christmas tree. The bright color and glimmering snowflakes create Christmas cheer, while the starbursts of light ring in the New Year like fireworks in the night sky. 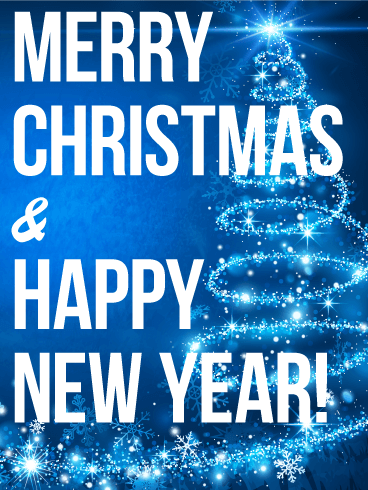 Share your holiday greetings and cheer with this blue Christmas tree card! It's time to celebrate the holiday! Remember your childhood with the warm, traditional holiday scene on this Christmas card. 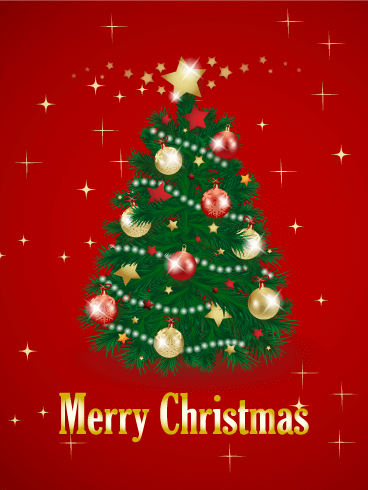 Presents wrapped in white and red paper are tied with red ribbons and waiting beneath a lit and decorated Christmas tree. A snuggly teddy bear rests beside Santa's sack of presents, ready to delight a child on Christmas morning. Let this touching scene say "Merry Christmas" to your loved ones and friends. 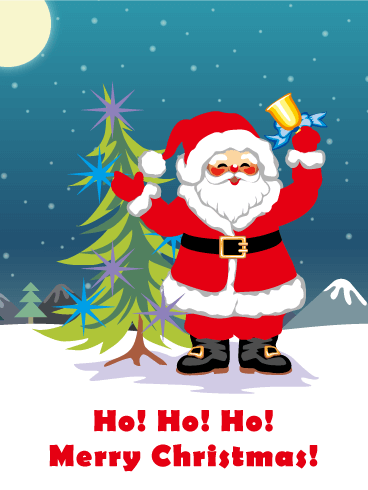 On this silent, holy night, Santa and his reindeer fly around the world, delivering presents to people young and old. The charming village on this Christmas card sleeps quietly as they wait for Christmas morning and the presents laid under the snow and ornament covered village Christmas tree! 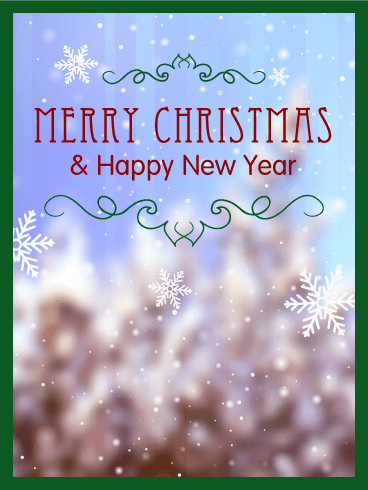 Show your Christmas cheer by sending this cheery holiday greeting to your friends and family this holiday season! Let it snow, let it snow, let it snow! 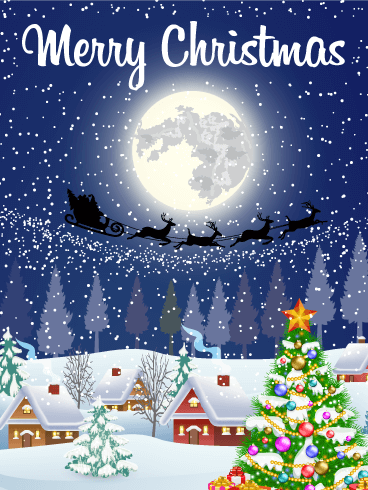 We all dream of a White Christmas, and this gorgeous Christmas card delivers just that! The elegant scrolling and enchanting snowflakes remind us to be merry. 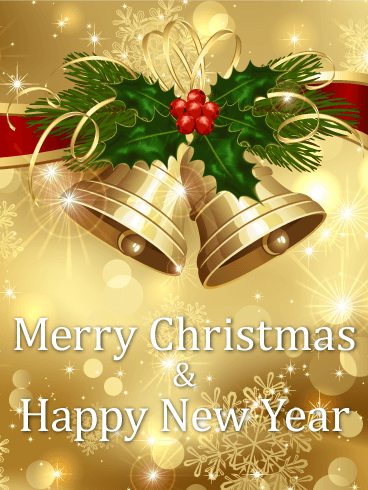 Christmas is almost here, and with it a New Year of hopes and dreams. Each snowflake that falls is completely unique. 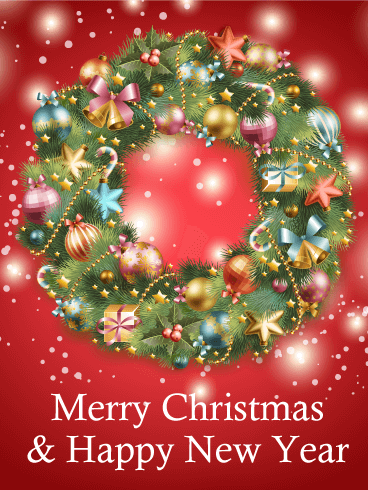 Share the exquisite beauty of the Christmas season with this simple but stunning Christmas card. 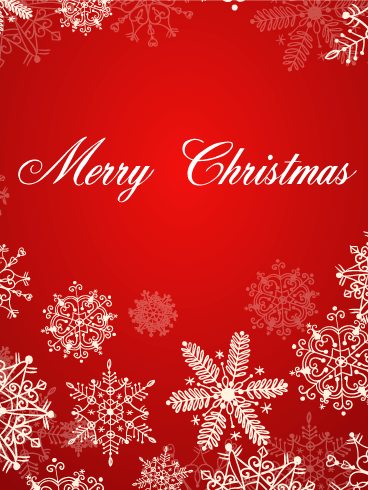 The white snowflakes stand out against the deep red backdrop and are a lovely way to wish someone a happy holiday. Delicate and gorgeous snowflakes adorn this Christmas card. The festive white and red remind us of peppermint canes and Santa's suit. For a card as unique as a snowflake, send this joyful Christmas card for a holiday filled with good cheer and goodwill.